we share stories and warm memories. 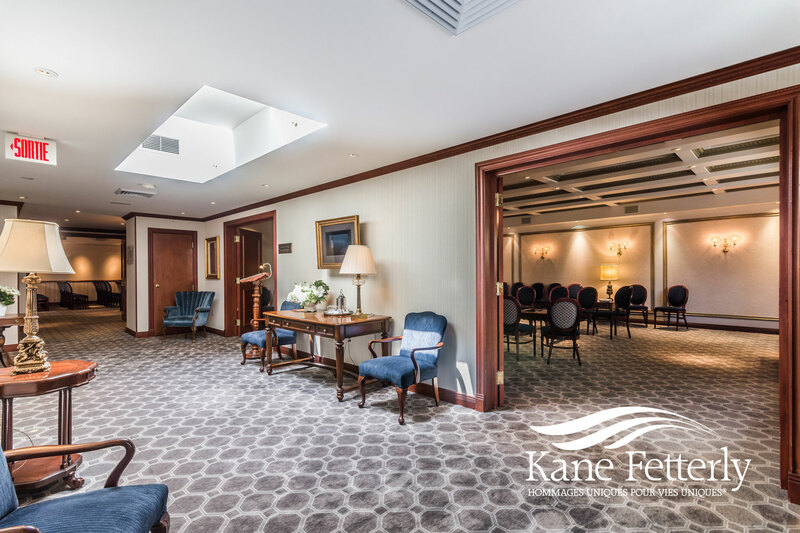 Kane & Fetterly is one of the few remaining family owned and operated funeral homes in Montreal. We remain independent of international funeral industry conglomerates so that we may serve families with personalized professional funeral services. Our funeral home is able to provide complete funeral services for every religion and nationality. Our services include cremation and burial services, funeral pre-arrangements, repatriations to native country, reception facilities and aftercare (administrative support after the funeral, grief counseling). In 2017 Kane & Fetterly has launched alaVida.ca, an online cremation provider as well as a special events division to create custom life celebrations at the location of your choice. Please contact us. Our staff will be more than happy to answer all your questions or provide you with additional information. Alternatively, please feel free to browse our websites to learn more about our heritage and the complete line of services and products that we offer. Someone has just passed away. What do I do? What are the first steps in the event of death? Which information is required when meeting with a funeral director? Feelings of sorrow and loss do not go away after the funeral and neither do we. Our funeral home provides continued assistance if needed. Choosing cremation does not limit your options when it comes to celebrating and honouring the life of your loved one. Bridget, Christian and the entire team at Kane and Fetterly handled my father-in-law’s funeral arrangements with discretion, sensitivity, attention to detail and kindness. We could not have asked for a better partner in this most sorrowful of journeys. Heartfelt thanks from the Haber family. Just a heads up. Make sure you do a sound test if you are using recorded music for a funeral here. My friend requested three passages from Verdi's Requiem for her funeral. When they were played, they were inaudible. Instead we had three periods of near silence. I don't know what kind of technical problem occurred, but we were told that their laptop was playing at maximum volume and that there was nothing they could do. Two other selections, one from Leonard Cohen and It's time to Say Goodbye played normally. I have been to funerals here that went well, and the reception and catering for ours were done to perfection. Reverend Bonnar gave a wonderful service. We would have given this home five stars if not for this. Just make sure that you insist on being present for a sound test of all of the music with enough lead time to find solutions. It never occurred to me that an experienced funeral home could encounter this kind of a problem. I appreciate all the help from your professional and courteous staff that helped us at every step of the way. I highly recommend Kane Fetterly. Le personnel est professionnel, courtois et efficace. Le support et les informations fournis sont des plus judicieux. Nous avons été entièrement satisfaits. Merci. Facilitated my mom's funeral arrangements so that it made this bewildering experience feel natural, easy and effortless. Really appreciated the support and the respectful treatment by the funeral director and all the staff. Received lots of positive feedback from friends & family about the venue as well, which was immaculate. The kitchen was well-equipped and perfect for our needs. They exceeded my expectations and I would not hesitate to recommend their services. I highly recommend Kane Fetterly Funeral Home, as a professional, comforting, courteous, family business offering help in all ways possible during a difficult time. They are competitively priced, yet offer a higher tier of service than most places around Montreal. Mourning is a very difficult time and they help a family get through this as best they can and they think of everything. A huge thank you from my family for our recent service and past service we have had at your caring establishment. I would like to thank Martin for his professionalism in preparing my mother Mary (Tomchin) Olynyk by capturing her essence. I would also like to thank Chris for going the extra mile during this most difficult time. His help and suggestions with preparing the video, the catering and all the other little details was a great help. The funeral day went very smoothly. I would also like to thank Jane for her assisance in matters pertaining to the paperwork that needed to be done afterwards. Many positive comments were made about the viewing area and the use of the kitchen was very helpful. I'm glad that everyone's reviews are so positive given the circumstances, but unfortunately our experience was not a good one for several reasons. To begin with, they quoted us a price for everything but then when the final bill came in, it was about one thousand dollars more. Then, we asked them not to embalm the body and they told us that this was not possible to which my mother requested that they do so as minimally as possible, and she also asked them NOT to have the body exposed. They COMPLETELY ignored her requests, aggressively embalmed the body, altered his face to the point where he was not recognizable as well as exposing the body, everything they were asked not to do. Communication was horrible, when my mother spoke to the embalmer later, he claimed that he had no knowledge of these requests. Then they lost the picture that we provided and were expecting to get back, all things that made a very painful and sad event even worse. The best in town hands down, they help and care. They did everything. My father passed away just over 1 month ago, and we held the funeral service for him at the Kane and Fetterly Funeral Home at that time. Its director, Ms. Bridget Fetterly, is a model of courteous and considerate professionalism. She took the time to answer my questions, and was readily available if more information and guidance were needed, much appreciated at a time when one is quite overwhelmed and grieving. She facilitated matters a great deal, accommodated cultural preferences, and I am very grateful to her and her staff at the funeral home for their demeanour and competence. 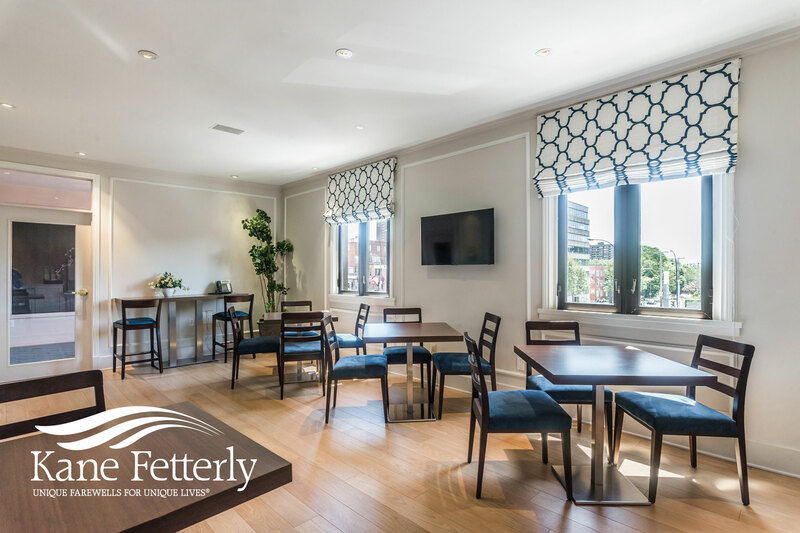 The facilities are elegant, and the caterer recommended by Ms. Fetterly provided a lovely assortment of refreshments, with culturally-sensitive flavours, for the reception we chose to hold after the service. I am sure my father would have appreciated this final tribute to him, made possible by Kane & Fetterly, were he able to witness it. My experience with Kane & Fetterly during a very trying time was excellent! 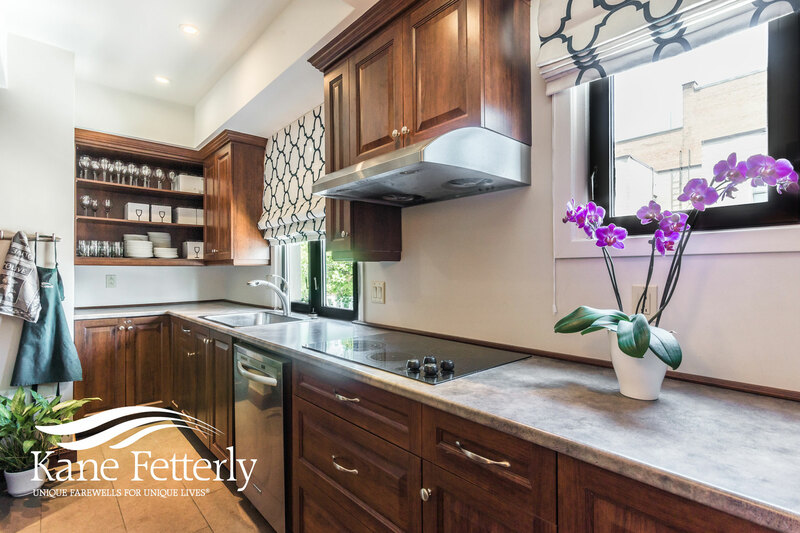 I was flattered how Bridget Fetterly is knowledgeable, friendly, warm and very well-mannered. All the staff has a very professional appearance and attitude. Special thanks Martin. I couldn't have asked for anyone better to handle the arrangements for my father. It was amazing how quickly all details were put together and what a beautiful job the funeral home staff did. I would definitely recommend them to anyone in need of their services.Thank you. I recently helped organize a funeral for a very dear friend. He passed away suddenly leaving his wife, his family and friends in shock. Christian, Jane and Jean-Louis did everything they could to make the arrangements easier for the family. They took care of every detail and in this case, the family had a particular vision of what they wanted to take place. He was very important to the music community in Montreal. And even three musicians somehow turned into 28 by the day of the service, Christian didn't bat an eye, he simply started moving furniture around to accommodate. Their attention to detail brought tremendous comfort to the family and the hundreds of people who came to pay their last respects. They helped make the celebration of Patrick's life a tribute that will be remembered forever. Thank you. L'équipe de Kane Fetterly rend honneur à leur mission - Un hommage unique pour une vie unique !Mon père est décédé en Floride et de l'instant où j'ai appelé le salon funéraire le 2 janvier au matin jusqu'à l'inhumation au cimetière ici à Montréal le 16 janvier dernier, tout s'est déroulé parfaitement. Ma famille et moi sommes très reconnaissants de l'accompagnement humain, personnalisé et discret que Kane Fetterly nous ont offerts. Grâce à eux, mon père repose en paix et notre deuil est d'autant moins pénible!MERCI! We lost our daughter, suddenly, on Dec. 15, 2014. We had heard many good things about Kane & Fetterly, and decided to meet with them. My wife and I have no hesitation in expressing how sympathetic, yet professional, the crew are at Kane & Fetterly.They helped us through our most difficult time. Their attention to detail went beyond our expectations, and the services the staff provided were exemplary; in the manner in which they provided the special touch, in providing an endless supply of coffee and refreshments, in the way they opened their kitchen to us, and when we needed anything, whatsoever,the staff came through for us, no matter how small or large the request, without us having to compromise on anything.Losing someone close to you is never pleasant, but they gave us the comfort in knowing and feeling they cared. Rose and I can honestly say that Kane & Fetterly really made a difference! Last month my cousin had a viewing at Kane Fetterly. At 10:00 pm, which is the closing time, there were still a lot of people. Jane Blanchard who was the after-care counsellor didn't hurry us (the family) and the visitors to leave the funeral home. The time the viewing started, she came many times to ask what we need. She showed us the kitchen and where to get the things that we need. She was very attentive and very professional and very friendly. Few weeks ago, I went back to meet with Mary Pallett, the funeral's counsellor to discuss a pre-arrangement for my living mother. Like Jane, Mary is also very professional, very friendly and very attentive. Because of the outstanding service Kane Fetterly had rendered during my cousin's viewing, and the price which is far less expensive than any other funeral homes, I have chosen Kane to do business with. The staffs are undeniably so very friendly and the funeral home itself is family oriented. I highly recommend Kane Fetterly!